More than 140,000 people will overdose on drugs every year in the U.S. Drug use impairs a person’s judgment, and people will often mix different drugs and alcohol, producing near-fatal effects. Millions of people in the U.S. struggle with an addiction to drugs or alcohol, and the longer a person goes without treatment for drug addiction, the chances for overdosing increase. It’s critical that people can recognize the symptoms of a drug overdose and contact emergency services before it is too late. 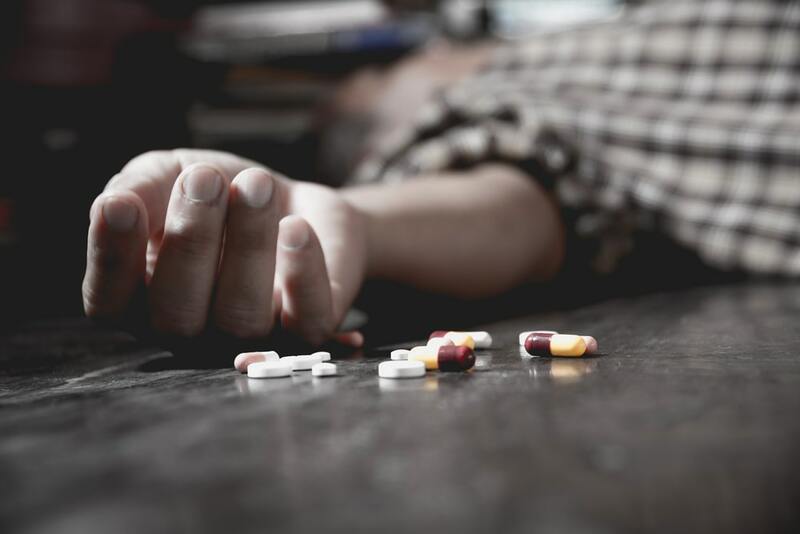 The following article will explore the rates and statistics regarding drug overdoses, and the symptoms of a drug overdose. What are the rates of drug overdoses in the U.S.? Almost any drug, legal or illegal, can be deadly if someone takes too much of the substance or mixes it with another drug or alcohol. Drug overdose emergency room visits and drug overdose deaths have dramatically increased in the last few years, thanks to the opioid epidemic. On average, patients who are admitted to the ER for a drug overdose stay in the hospital for six days, and the average cost of a drug overdose admission exceeds $8000. Drugs of abuse, anticonvulsants, pain medications, antibiotics, and respiratory drugs account for the majority of hospital admissions for drug overdoses. How often do drug overdoses lead to a fatality? The U.S. has the highest rate of overdose drug mortality in the world. The drugs most responsible for overdose deaths are opioid derivatives. In 2016, the CDC estimated that 64,000 people died from opiate overdoses. In 2016, opioid-related overdoses rose by 5.6% each quarter, indicating that the problem regarding drug overdoses is worsening, and not getting better. People who are dependent on an opioid drug are the most likely to experience an overdose and to overdose on the drug repeatedly. Why does an opioid dependence increase the risk of overdosing on the drug? Even though opioids are legal and commonly prescribed for a range of different health issues, they can be incredibly dangerous. Unlike many other drugs that are commonly abused and overdosed on, opioids are particularly hazardous because they have a strong effect on the parts of the brain that control and regulate breathing. Also, it’s incredibly easy for the body to build up a tolerance to the medication, and develop a physical and psychological dependence. Even if a person takes opioids as prescribed by their physician, the body can become physically dependent on the drug. Stopping opiates leads to painful withdrawal symptoms. People who are dependent on opioids can find themselves taking more and more of the drug to stave off withdrawal symptoms and get the effects they want, whether that’s to induce a euphoric high or to alleviate physical pain. In many fatal opioid drug overdoses, the patient mixed opioid medications with alcohol or other sedatives. In the vast majority of opioid overdose deaths, the fatalities were preventable. When it comes to opiate drugs and their derivatives, tolerance happens quickly, but tolerance also fades quickly. People who’ve stopped taking opioids, and then retake them will find that they do not need as many opiates to get the intended effect. They can accidentally overdose if they take more than their body can handle. What are the signs and symptoms of a drug overdose? The majority of drug overdoses are unintentional. A user may overdose by taking a regular dose of a drug after their tolerance has lowered. Sometimes, people accidentally combine substances without realizing that the drugs can interact dangerously. In some cases, a user may forget that they’ve already taken a dose of their medication and can overdose accidentally on a prescription. With illegal drugs, a user doesn’t know how much of the substance is in a dose. For example, powder cocaine can be mixed with heroin, and ecstasy tablets can sometimes be made with methamphetamine. People who drink alcohol in a nightclub setting can have drugs like Rohypnol slipped into their drinks, and suffer an overdose as a result. When someone overdoses on a drug, whether legal or illegal, the situation is always a medical emergency. After a user exhibits these initial symptoms of an overdose, they may begin gasping for air, vomiting, breathing erratically, and lose consciousness. Overdoses that are not treated quickly can lead to seizures, coma, and death. People who reach the end stages of an overdose and survive may live with permanent brain damage or other disabilities. When the initial signs of an overdose first begin to show, it’s critical that the person is taken to the emergency room immediately. What should someone do if they suspect an overdose? Many states have Good Samaritan Laws in place that protect the overdose victim and the person who calls 911 from prosecution for drug-related possession and crimes. Always call 911 immediately in the case of a suspected overdose. If the person is unconscious, position them onto their side. If they are left on their back, they can choke on their vomit and asphyxiate. Do not give them anything to eat and drink. When contacting emergency responders, tell them what drug the person is suspected of overdosing on. There are overdose reversal medications that emergency responders can give to the individual. Never leave a suspected overdosing individual alone, and stay with them until emergency responders arrive. If you or someone you love is struggling with drug abuse and addiction, the representatives at Windward Way can help. Please contact us today to get treatment for drug abuse for you or a loved one.